We are devoted to providing South African business owners with user friendly management tools, affordable website design services and effective marketing/management support - facilitating growth, increasing sales and improving profitability. Our products include EasyBooks FREE small business accounting software, Pastel Accounting Software, a number of professional yet affordable website design packages, easy to update websites with content management systems and custom software solutions. 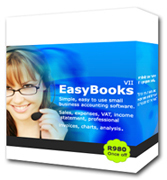 EasyBooks accounting software is extremely easy to use. This is the only accounting program that has been designed specifically for the small business owner. Whether or not you have any bookkeeping experience, or if you're not highly computer literate; you will be able to master this simple accounting package in no time at all. Price: EasyBooks Accounting is now FREE. Pastel is the leading provider of accounting software systems in South Africa. Many people have the perception that Pastel Accounting software is far too complex for them - while this can be true in some situations, you need to be aware that Pastel Accounting also have a few simple accounting packages to choose from. These include Pastel Invoicing, My Business and Xpress. We have a few free downloads available, have a look at the downloads section. You may also want to consider Turbocash free accounting software. We are currently looking for sales affiliates nationwide. If you're interested in our part time jobs then click here to find out more. Please contact us if you have a service, product or skill to offer that will assist in the development and growth of small businesses.